It is no secret that I'm a coffee lover. I'm kind of a coffee snob, too, and I'm not ashamed to admit it. I hate work coffee, gas station coffee and church coffee that is brewed in bulk, watered down and tastes like dirt..... I prefer quality coffee that is filled with flavor and makes your taste buds dance. I don't use creamer because I genuinely love the flavor of the coffee I buy - just a splash of milk enhances it so well! Now, of course, I'm basic and love me some Starbucks BUT local coffee shops are always my first choice because they brew the best stuff. I'm literally such a coffee snob that I just bought THIS single serve coffee maker for my office because I hate work coffee so much haha. No shame. Weekend mornings in our house are aaaaall about waking up slow with good coffee and couch time. While C cooks breakfast, I play barista. 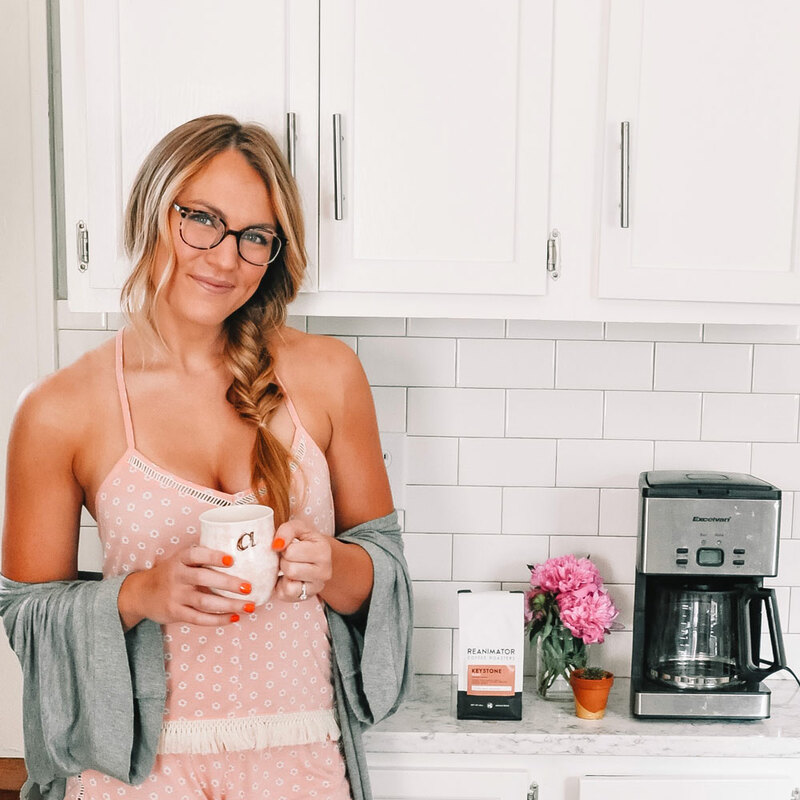 I grind coffee beans, prepare our morning brew and pick out our mugs of the day (I have quite the collection). We always buy craft coffee so I was super excited to discover Trade Coffee Co. They sell freshly roasted coffee from all the best roasters in the country and ship it directly to your doorstep. One really cool thing about Trade is that they offer a "Taste Profile." It is basically a short quiz that matches you up with a coffee that you will love from first sip. Like Match dot com for coffee, haha. 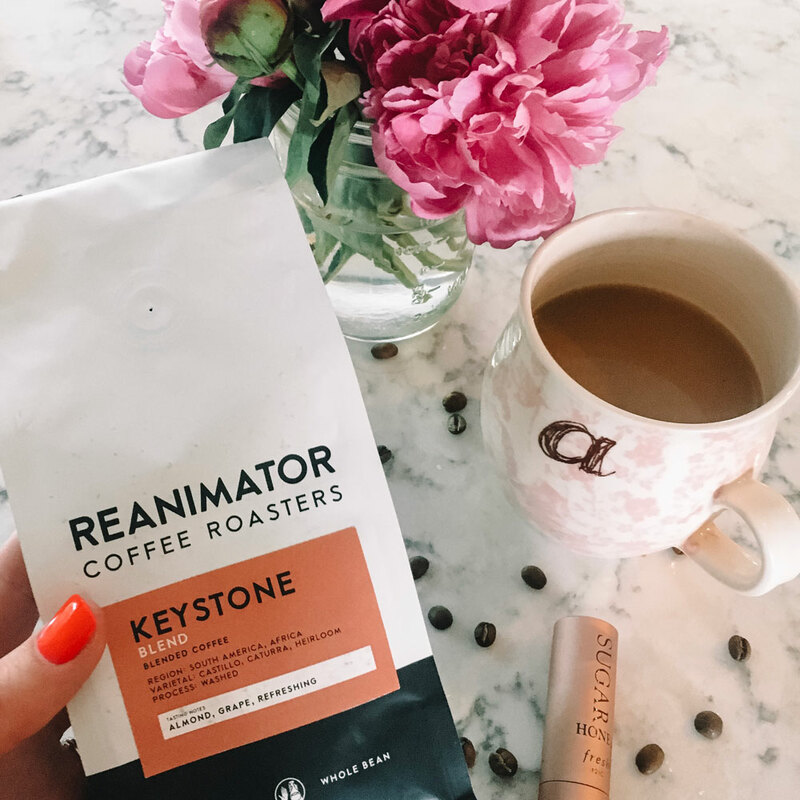 Trade matched me up with the ReAnimator Keystone Blend and I absolutely love it! It is so bright and refreshing but packed with flavors - it makes a great iced coffee. You can take the match quiz here! Of course you don't have to buy the recommended coffees, there are many others available on their website! I discovered that Trade sells Onyx coffee - my favorite of all time (I LOVE The Monarch blend). My parents live in NW Arkansas where Onyx is located so I until now, I would have to stock up on coffee beans every time I visited and try to stretch it out and make it last until the next visit. Now, though, I can order my Onyx beans strait from Trade whenever I want! Best thing ever. If you're a coffee snob like me and want your at-home coffee to be just as delicious as coffee shop coffee, definitely give Trade a try. You can use code TRADE_2f674j for 50% off your first bag! Tell me....what is your favorite coffee or coffee shop in the world? Thanks for reading and cheers to a great week ahead! Thank you Trade for sending me my first bag of beans on the house!